Now, today’s recipe. When cauliflower pizza crust first started making its way around the internet, I quickly dismissed the idea because clearly it was crazy. 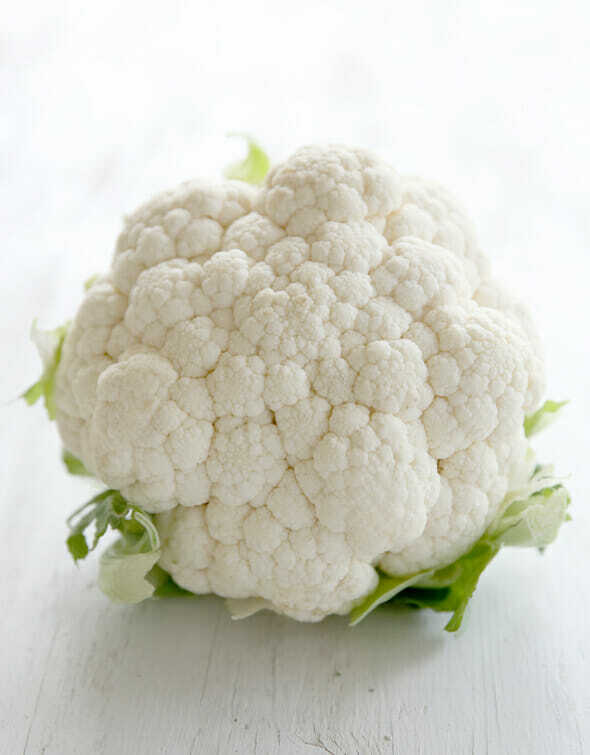 Besides the fact that a bland colorless vegetable is no substitution for soft, chewy, carb heaven, I don’t even really like cauliflower (except roasted. In our garlic oil. Then can eat 947 pounds of it at a time), so why would I ever disgrace the name of pizza with it? But then a saw a couple of my blogger friends comment that it was a hit in their homes and I became intrigued. Still, I made it just for myself, because there was obviously no way anyone in my family was actually going to eat this. But guess what? They did. 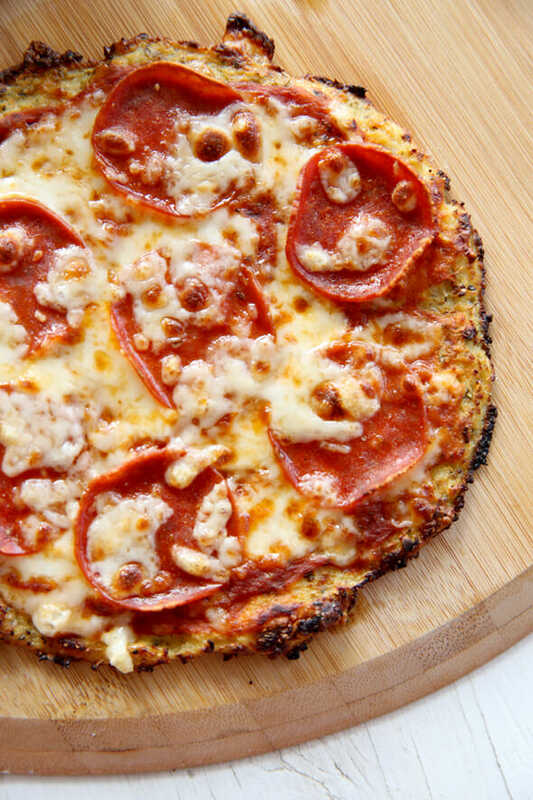 My kids each ate an entire pepperoni cauliflower pizza. Now obviously this isn’t going to taste like bread. Obviously. But if you’re really trying to eat lighter, or you can’t have wheat and carbs for whatever reason, this is a pretty awesome little trick to have up your sleeve. It’s definitely a different texture and flavor than actual crust so set your expectations accordingly and you might be pleasantly surprised. So you start with some pulverized cauliflower. This is the same process as when you’re making cauliflower rice. 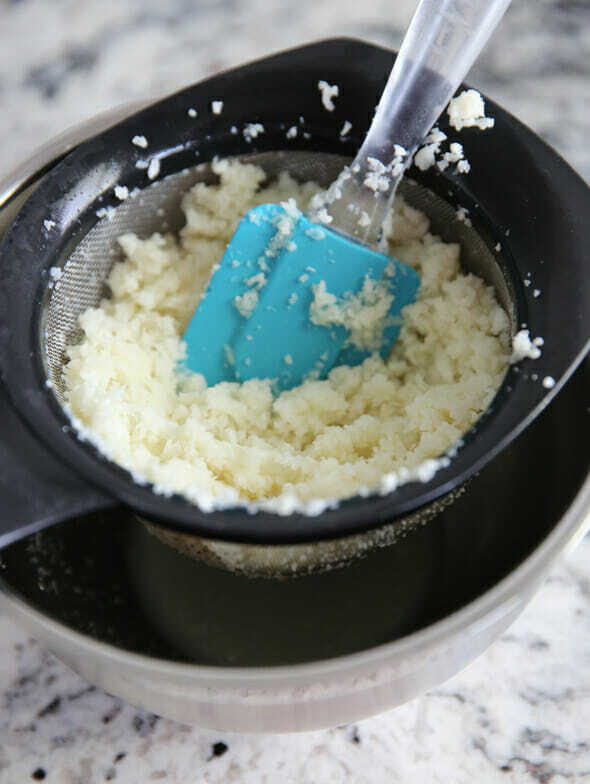 My food processor bit the dust, so I’ve just been using a standard cheese grater and it works great. A high-powered blender like Blendtec or Vitamix works as well. You’ll cook it in the microwave until it’s soft, and then press out the liquid. It’s important that you really get out as much liquid as you possibly can so I put it in a fine mesh strainer and press the heck out of it with a spatula and then smash it with a few layers of paper towels as well. I’ve noticed that sometimes I expel a huge amount of liquid, and sometimes hardly any at all, but give it a good press regardless. To that, we’ll add an egg, some cheese, and seasonings. Now there are lots of recipes floating around the internet for this and they’re all basically the same, but the quantity of ingredients really vary. The first recipe I tried called for over a cup of cheese, which in my opinion didn’t make this any less caloric than normal pizza crust! It also made it taste like a souffle, which was weird. I played around with the ratios until I got something I liked that cooked well, and used enough cheese for flavor and texture, without going overboard. When I kept recipe hunting, I found my ratios were almost identical to this recipe, so I tried her seasoning mix and it was great. She has a few more steps (and optional ingredients) if you want to check out her post. Once you have your mixture, you’ll press it into a flat pizza shape. I’m making 2 small pizzas here. Then you’ll bake them in the oven until it’s really golden brown. After that, you can top it any way you like. 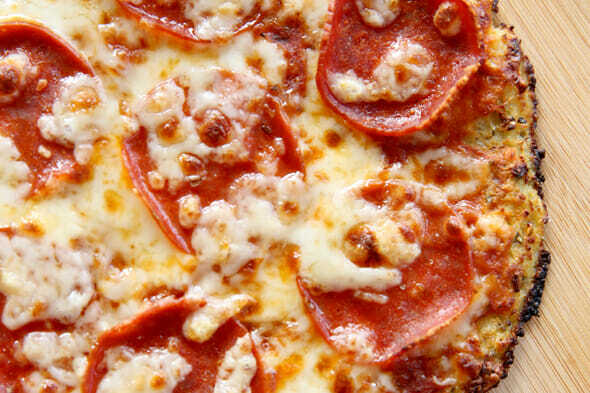 My kiddos ate this turkey pepperoni and cheese pizza with no questions asked. They knew it was obviously different, but they still ate the whole thing without complaint so I consider that a win! For my own pizza, I love the classic combo of sliced roma tomatoes, mozzarella, and fresh basil. The secret that really makes it taste amazing is a little drizzle of our Dipping Oil right over the top! This sort of recipe is one of those ones that is in my opinion, all about the toppings. If you taste the crust by itself, it’s okay, but what makes it taste great is adding on delicious toppings, and then it becomes a really low-cal carrier for all of that deliciousness. So I do recommend using pizza sauce and flavorful toppings! Press mixture out onto a baking sheet lined with parchment paper that’s been sprayed with non-stick spray (I’ve found parchment produces better results that a silicone baking sheet). Press out to about 1/4 inch or slightly thicker. Keep mixture tight together and in an even layer. You can bake one large pizza or multiple smaller ones. 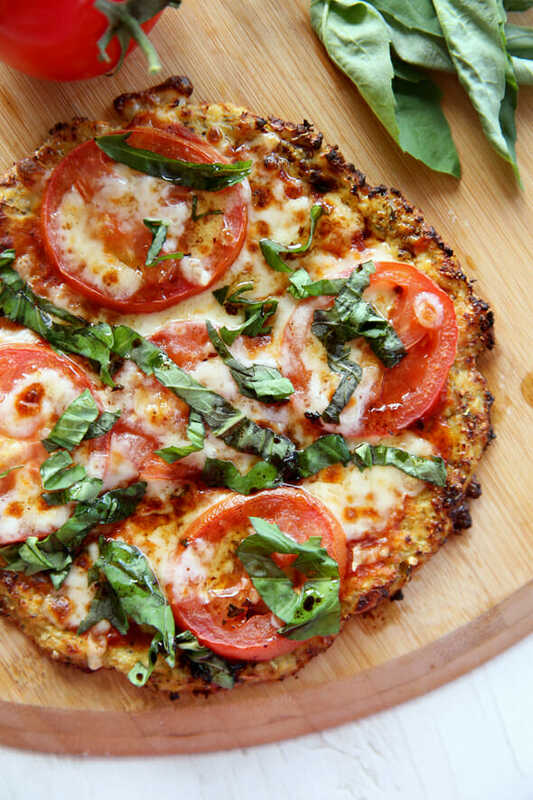 Have any of you tried cauliflower pizza crust? Any tips or tricks you’ve discovered? What temp do you bake it at? This is so crazy! Yesterday I read my first recipe of zucchini pizza crust. Now I really have to try it if my two favorite most trusted food bloggers are jumping on the band wagon. Going shopping today so, here goes! I’m excited to try this! I’ve heard of it before but thought it sounded a little too wacky….if you guys liked it though, it’s totally worth a try. I love your recipes. 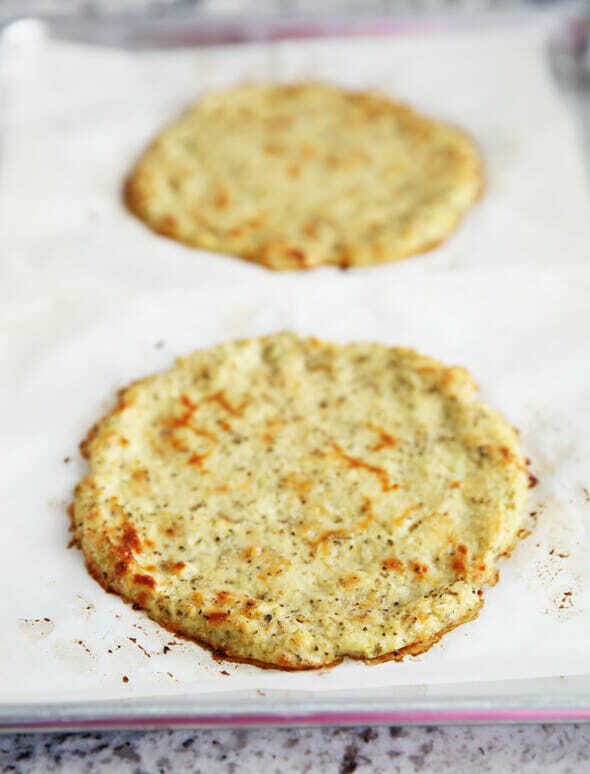 I have made cauliflower crust a couple times as well and agree that the first one I tried had a ton of cheese in it and seemed to defeat the purpose! Squeezing the liquid out is definitely key. Even when I feel like I’ve squeezed it all out it still feels moist and I end up getting more out of it. I have tried to make this countless times and can never get it right it seems. is the secret to the squishing of liquid or maybe making smaller pizzas? Can you pick up a slice like a regular pizza? Also does this recipe make one 12 inch or 10 inch pizza or is it smaller? or does it make more than one? maybe I missed that somewhere? It kind of varies; you just form it into the size you want, but I’d say it’s about a 10 inch pizza, or obviously you can make smaller ones. Squeezing out the liquid is definitely a huge part. You can also try baking it on a pizza stone to get it crispier. If you do that, you can pick up the slices! When I make it, I definitely squeeze out the liquid, form a crust about 1/4″ thick, but cook it much longer. I do 30 minutes, flip it and cook 10-15, top it and cook 10-15 more. Then it is sliceable and able to be picked up and eaten. I hope this helps! Check out the link I noted in the recipe, she actually has a cheese-free version you can try! The key too good crust is “wringing out” the cauliflower in a thin cloth!!! I have tried two different recipes and yes squeezing out the water made my second attempt better. I look forward to trying this one as I it looks crispier than my other attempts. Thanks. 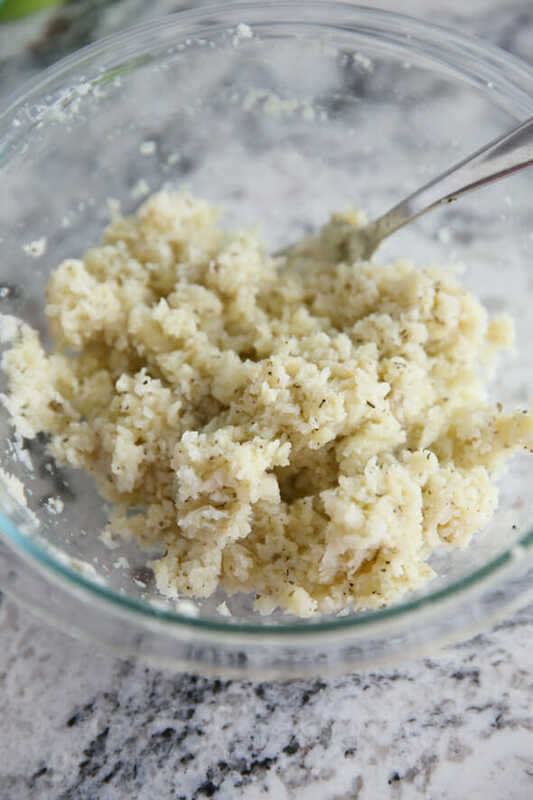 I so want to get on the cauliflower for all your favorite foods bandwagon but every time I’ve tried any of the recipes, I always feel like it makes a huge mess out of my kitchen with little cauliflower bits flying everywhere. And you even used a cheese grater! I really want it to work. I’m trying to eat healthier and reduce gluten and unnecessary carbs in my diet. Am I missing something or do you all just put up with the mess? Is there some secret to not having it go all over the place? Even when I’m just cutting it down to prepare it I feel like it’s a total mess. Trader Joes has fresh and frozen cauliflower rice. Also I say someone put the cauliflower in a blender with water and pulse it to sdesired onsistancy and then drained the water. This however, might add more moisture? Hi, I am from turkey, I open cafe in turkey and I try alot of pizza from your webside. Thanks. I made this tonight! It turned out great. I think it will be a new family tradition. I tried to dry the cauliflower but using a strainer, paper towels, etc. but it was still damp. I think because I washed it right before? Next time I will try washing it earlier in the day, grading it and letting it fully have time to dry. It still turned out delish, just the dough was falling apart. How many servings or how many inches does this recipe yield? It makes about one med pizza, maybe 10-ish inches? Tried this tonight! It was really good with just basil and tomato, but it didn’t come out as crispy as I’d hope….I had to eat with a fork. Any suggestions? Thanks! Yep, it’s all about squeezing out the water! 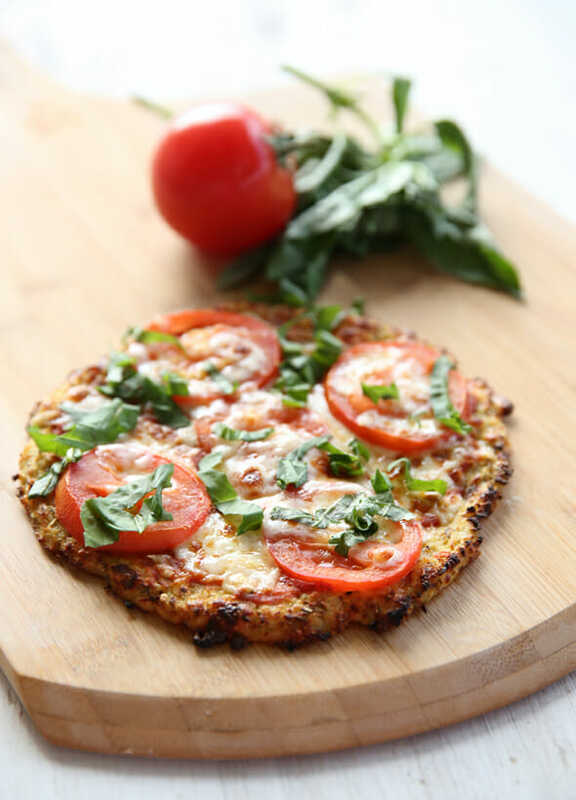 My family makes cauliflower crust pizza all the time! I would love to try your recipe, it is different from what I have done in the past. Have you ever tried a cream cheese crust? That is great too! Some pizza places make a good gluten free crust too! 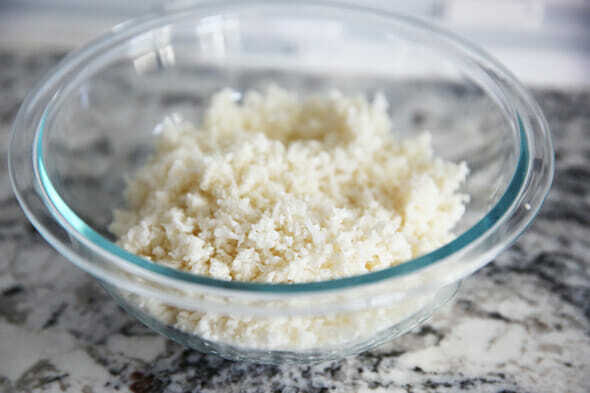 Can I freeze the cauliflower premix (just before shaping it and minus the eggs) when the couli’s are in season? I would think so? But I’ve never tried it so not sure! 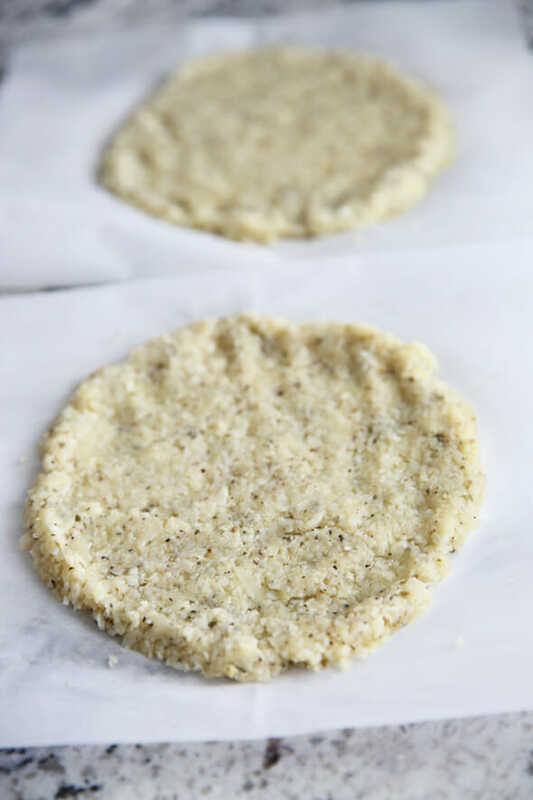 When making zucchini pizza crust, I’ve used a nut milk bag to squeeze out water from the zucchini. I could get it pretty dry that way, and the pizza turned out great. If I make this crust, I will be using my nut milk bag. Can this be made on a pizza stone? sure- but I would still use the parchment on it. Hello, would you recommend using a pizza stone to cook the cauliflower pizza? You certainly can, but I would still use parchment on top so it doesn’t stick. Love love love it only thing I am trying to do is make it a little crispier. We don’t have a microwave, could we steam or oven the cauliflower before? or the texture won’t be the same? many thanks for sharing your recipes! You can totally steam it. That will work perfectly! I plan to make mini-pizzas later tonight, but my question is this… how do the leftovers hold up? I’m cooking for one, but like to do meal prep on Sundays for the week ahead. Should I just prep the cauliflower and only make the actual pizza I’m going to eat tonight, and put the rest of the crust mixture in the fridge for a pizza another night? Or can I bake a few pizza and will it reheat well for work lunches throughout the week. Anyone tried any of these options? What about freezing the crust mixture for another time? 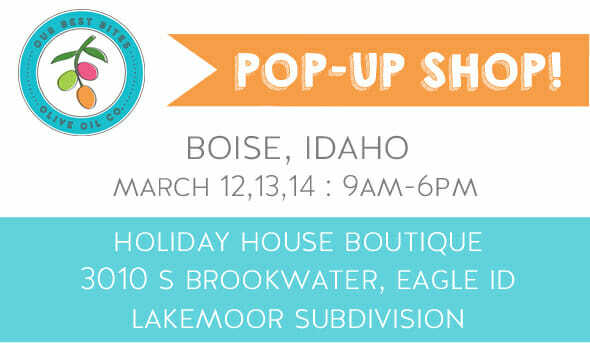 Thanks in advance for any responses! Honestly, I’ve never tried any of those options! I think for sure you could just save the mixture (or freeze it) and then bake the pizza when you’re ready to eat. I’m thinking that’s your best option, but you could experiment with those others. If you find something that works well, come back and let us know! My family is on the Daniel Fast and can’t have dairy…so no cheese. What would you recommend as a substitute for the cheeses? Sorry, I don’t have any ideas for ya! Love this recipe! Turns out great, no matter how much I add my touches to it. Today I used some cream cheese, like the “fathead” crust recipe (which is ok, but not nearly as good!) and it turned out he best ever! How much cream cheese did you add? One week into doing low carb and we decided to try this. Kept our expectations low just in case. There was absolutely no need to. It was really good. My husband kept saying how good it was! So glad you liked it! I know what you mean about keeping expectations low, haha! Hey everyone, I made this recipe for the second time tonight and will continue to make it like FOREVER! Thank you for the awesomest cauliflower pizza crust! The only thing that I do differently, is that when the crust comes out of the oven for the first time, I turn it over and peel off the parchment paper, then I put the toppings on the softer, side… This way you can hold the slice and it doesn’t fall apart… Just thought I’d share? I found your recipe 6 months ago and finally tried it today. And what can I say…. it was delicious! I baked the base once for 15 min, then went with the dogs for a walk and when I got back home i turned it upside down and put it back in the oven while i was preparing the toppings. After adding the toppings I put it in the oven one more time until the cheese was melted. The crust turned out really nice that way. Also, i squeezed a lot of water out of the cauli flower. I do believe it makes a big difference. Thank you for this great recipe! I just tried this recipe tonight. I drained the water then realized I forgot to cook it. so I did that backwards but it turned out fine. I like this. I did tomato and basil as a topping. I also did broccoli and cheese with olive oil. yum. thank you! I will be making,this again for sure! Mine always sticks to the parchment; how do I prevent this? Spray your parchment with non-stick spray! Use a SilPat, or silicone baking mat! I made this for supper last night and it worked perfectly. Could I dry out the cauliflower in a Walmart dehydrator. Just like how I would dry banana chips. Your recipe sounds delicious, I will try, I was reading thru comments, one person asked could you replace cheese because of allergies…Nutritional yeast is used in alot of vegan recipes…Do you think nutritional yeast would work, taste like cheese, looks like parmesan cheese…it can be sprinkled on potatoes, cauliflower to get the cheese taste…. You’ll just have to try it- I have no idea! I was super skeptical about a cauliflower crust for a pizza, but wanted to try it and see… I LOVE it!! You can’t even tell it is cauliflower! Going to be making this many more times. I just made this tonight and it was AWESOME!! My son who is the pickiest eater ever even loved it! The flavor of the curst is amazing! The spice mixture is perfect. I will definitely be making this again! But, I was wondering if you can make the curst ahead of time and then just add the toppings and heat it up when your ready to eat? If so, this would be a great idea for a busy weeknight meal. I’ve never actually done it that way- you’d have to try it out and let us know! 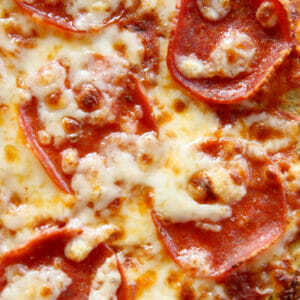 I made this and the taste is wonderful, I used cherry tomatoes, mozzarella cheese and pepperoni for the topping. I could cut it into a regular slice and pick it up. But getting the water out was a upper arm workout (didn’t have a strainer fine enough to us) so I had to use the ring it out through a towel – many towels. Would be worth it again from time to time. I’m a little late to the party, I know, but this was delicious! Though I made regular pizza for my picky kid first and had a slice, so my first bite was “ugh, cauliflower.” It’s even good reheated. My sieve is too weaksauce to wring out much water, so I used a paper towel, which worked okay, but I destroyed that towel and had a little more liquid left. Haha.